On the night of March 26, 1996, seven Trappist monks were abducted from the Monastery of Tibhirine in Algeria by members of the Armed Islamic Group, a radical Islamist movement fighting to overthrow the Algerian government. Two months later their decapitated heads were discovered on a road near the town of Médéa. The Armed Islamic Group claimed responsibility for the murders, though the exact circumstances of the monks' deaths remain unclear, with suspicion clinging to the Algerian army. This massacre forms the basis for Xavier Beauvois' film Of Gods and Men, but it is not its subject. The various conflicts inherent in the monks' situation — between Algerian nationalism and the legacy of French colonialism, between clerical and lay authorities, between their own Christian quietism and Islamic militancy — are always present in the background. But the foreground is occupied by more intimate concerns. Instead of focusing on the monks' confrontation with the world surrounding them, Beauvois and his screenwriter Etienne Colmar shift the field, asking why they decided to stay in the first place, despite the obvious risks posed by being in the crossfire of Algeria's civil war. This decision becomes the narrative backbone of the film; its most compelling question is not whether the monks live or die, but whether they can maintain themselves as a spiritual community and live up to the rigors of their rule. We first meet the monks before the violence starts, or at least before it intrudes on their walled enclosure. Their monastery sits on a ridge above the village, surrounded by tall cedar trees (the woods, and the moorlands around them, mark the landscape as a twin to the Apennine highlands where St. Benedict first retreated with his companions). It is both a part of the community and outside of it. One of the first things Beauvois shows us is the monks awkwardly navigating the steep walkway down into town to attend a young boy's circumcision ceremony. Some join in the celebration with enthusiasm, others with restraint. Already we're starting to learn their personalities. Brother Christian (Lambert Wilson), the abbot of the monastery, is ascetic (he takes the fewest fries at dinner), scholarly (he keeps an annotated copy of the Koran on his bed stand), and unbending. 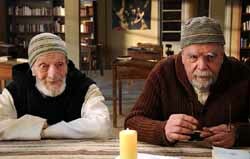 Luc, the medicine monk (the exceptional Michael Lonsdale) runs the free clinic; with his thick cable-knit sweater and ursine brows, he is the very emblem of worldly wisdom and steadfast practicality. Christophe (Oliver Rabourdin), the youngest monk, mans the tractor and struggles with doubt. Amédée, the oldest monk, looks as weathered and wind-blasted as a bristlecone pine, but he's in perfect health and is the group's main reservoir of selfless care and benevolence. When the violence begins — with the murder in broad daylight of a group of Croatian contractors — it affects the brothers in different ways. The Algerian civil authorities first offer the monks military protection, which Christian categorically refuses. The others balk at his unilateral decision, and urge him to take their voices into account. They meet in conclave, and each monk states his opinion on whether to stay or go. Only three of the eight seriously consider leaving. By majority rule they have clearly lost, yet the brothers nonetheless decide to pray over the matter. Over the course of the film, they meet several more times, and each time every member of the monastery is given equal opportunity to state his case, express doubt, or affirm his resolve. This slow, patient process of arriving at a decision without cajoling or bargaining is the heart of the film. Algeria presents (and this seems to be its destiny as far as the French are concerned) the monks of Tibhirine with an existential precipice, and they respond by living out a miniature version of deliberative democracy, which begins from an assumption of mutual respect and privileges conscience over strategy and consensus above expediency. All the violence in the film takes place against this backdrop of the struggle to achieve unanimity of purpose, which for these men is synonymous with the life of the community as a community. When the terrorists first breach the monastery walls searching for medical supplies for the local "pope," the encounter goes down like a Jesuit rewrite of the confrontation between Brother Juniper and the Tyrant from Rossellini's The Flowers of St. Francis, with Brother Christian calmly elucidating the shared ethical foundations of Christianity and Islam to the slightly perplexed but receptive militants. But this kind of casuistic lone-gunnery is the exception: when the Algerian army sends a helicopter to make menacing passes around the monastery, the monks respond by singing plainsong in the chapel over the sound of the spinning blades. The brothers' neutrality comes at a high price: the government treats them with contempt while the guerillas peer at them from the hills with hungry eyes. By the end, it's clear that the war is all around and there is no escaping it. The monastery feels forlorn and exposed, like one of those timbered army forts reckless colonels were always throwing up in the heart of Comanche country. At the moment of greatest peril, the monks respond by having a little soirée. One of them has just returned from France with gifts — books for Christian, medicine for Luc, and a splendid wheel of abbey cheese for everyone. At dinner, Luc brings out two bottles of wine and puts on a tape of the overture from Swan Lake. While the music plays and the monks eat, Beauvois shows their faces in extreme close-up, laughing, crying, and generally exulting in each other's company. It's a gorgeous scene, an island of bliss powerful enough to make you want to reach for a Catholic Encyclopedia and start reading about terms like agape and caritas. Some might find it to be offering either willful naiveté or facile apologetics. For me, it did the opposite, confirming my sense of how far the monks' actions were from martyrdom — how deeply their decision to stay was driven by stoic disavowal and a commitment to the bonds of their fellowship. Ultimately, this is Beauvois' hunch, but I think it works by shifting the ground from power politics to a consideration of the monastery as a self-contained world, deeply different from our own. Of Gods and Men only gives us glimpses of the Algerian militants, but what we do see — serious weaponry, holy purpose, civilian collaterals — is all too familiar. They may be the opposing team, but for the past decade at least, it's definitely our ballgame. The Trappists on the other hand, with their exquisite manners, subtle democracy, and final triumph over fear, aren't us at all.